, bishop of Lyons in France, was undoubtedly by birth a Greek, and, not improbably, born at or near the city of Smyrna. He was trained in the studies of philosophy and human learning: in the doctrines of Christianity, two disciples of St. John the apostle, Papias and Polycarp, were his masters. 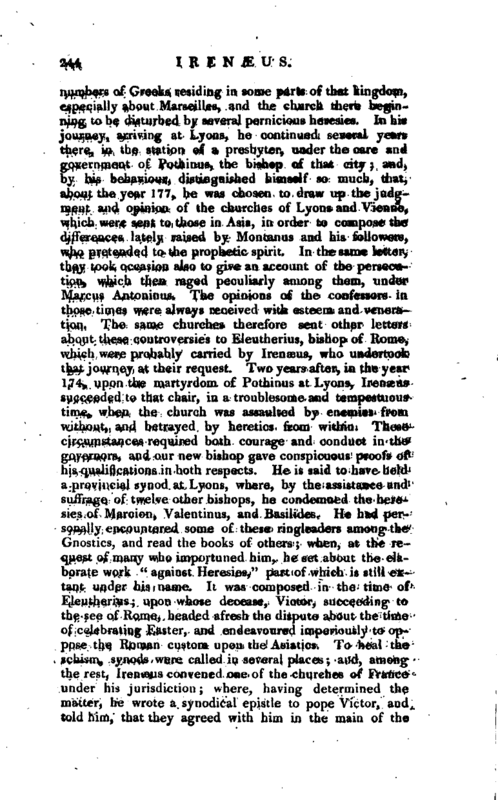 The latter he is said to have accompanied in his journey, about the Paschal controversy, to Rome; where, by his and Anicetus’s persuasioiij he was prevailed upon to go to France; great | numbers of Greeks residing in some parts of that kingdom, especially about Marseilles, and the church there beginning to be disturbed by several pernicious heresies. In his journey, arriving at Lyons, he continued several years there, in the station of a presbyter, under the care add government of Pothinus, the bishop of that city; and, by his behaviour, distinguished himself so much, that, about the year 177, he was chosen to draw up the judgment and opinion of the churches of Lyons and Vienna, which were sent to those in Asia, in order to compose the differences lately raised by Montanus and his followers, who pretended to the prophetic spirit. In the same letter, they took occasion also to give an account of the persecution, which then raged peculiarly among them, under Marcus Antoninus. The opinions of the confessors in. those times were always received with esteem and veneration. The same churches therefore sent other letters about these controversies to Eleutherius, bishop of Rome, which were probably carried by Irenseus, who undertook that journey at their request. Two years after, in the year 174, upon the martyrdom of Pothinus at Lyons, Irenaeus succeeded to that chair, in a troublesome and tempestuous time, when the church was assaulted by enemies from without, and betrayed by heretics from within. These circumstances required both courage and conduct in the governors, and our new bishop gave conspicuous proofs of his qualifications in both respects. He is said to have held a provincial synod at Lyons, where, by the assistance and suffrage of twelve other bishops, he condemned the heresies of Marcion, Valentinus, and Basilides. He had personally encountered some of these ringleaders among the Gnostics, and read the books of others; when, at the request of many who importuned him, he set about the elaborate work “against Heresies,” part of which is still extant under his name. 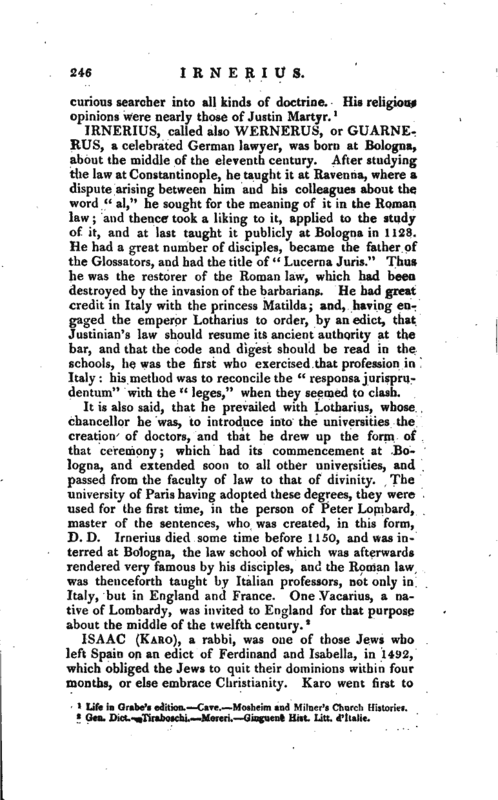 It was composed in the time of Eleutherius; upon whose decease, Victor, succeeding to the see of Rome, headed afresh the dispute abput the time of celebrating Easter, and endeavoured imperiously to oppose the Roman custom upon the Asiatics. To heal the sclmrn, synods were called in several places; and, among the rest, Irenaeus convened one of the churches of France under his jurisdiction;. where, having determined the matter, he wrote a synodical epistle to pope Victor, and told him, that they agreed with him in the main of the | controversy, but withal advised him to take heed how he excommunicated whole churches, for observing the custom derived down to them from their ancestors. He observed, that there was as little agreement in the manner of the preparatory fast before Easter, as in the day itself, some thinking they were to fast but one day, others two, others more, and some measuring the time by a continued fast of forty hours; and that this variety was of long standing, and had crept into several places, while the governors of the church took less care about these different customs than about maintaining a sincere and mutual love and peace towards one another; putting him in mind too of Anicetus and Polycarp, who, though they could not agree about their different usages, did yet mutually embrace, orderly receive the communion together, and peaceably part from one another. Irenaeus wrote also, to the same effect, to several other bishops, for allaying this unhappy difr fere nee. 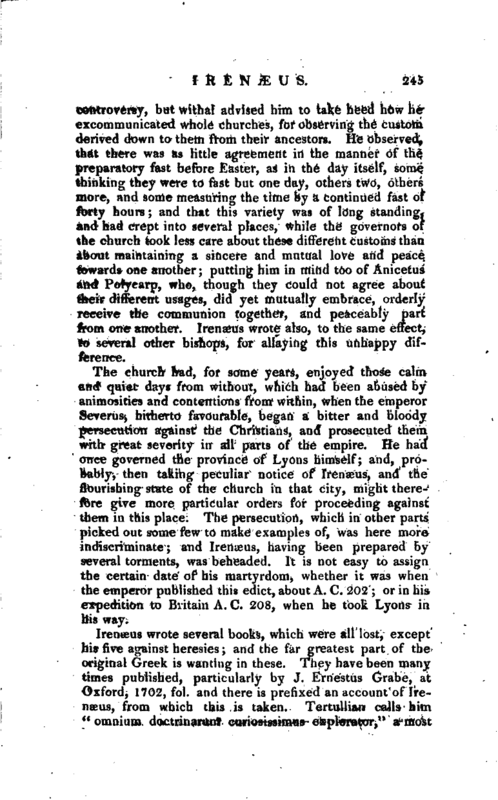 The church had, for some years, enjoyed those calm and quiet days from without, which had been abused by animosities and contentions from within, when the emperor Severus, hitherto favourable, began a bitter and bloody persecution against the Christians, and prosecuted them with great severity in all parts of the empire. He had once governed the province of Lyons himself; 'and, probably, then taking peculiar notice of Irenaeus, and the flourishing state of the church in that city, might therefore give more particular orders for proceeding against them in this place. The persecution, which in other parts picked out some few to make examples of, was here more indiscriminate; and Irenaeus, having been prepared by several torments, was beheaded. It is not easy to assign the certain date of his martyrdom, whether it was when the emperor published this edict, about A. C. 202; or in. 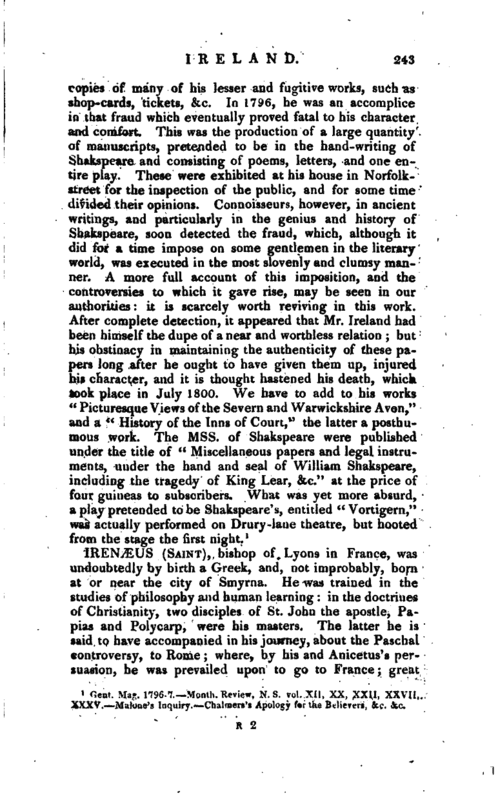 his expedition to Britain A. C. 208, when he took Lyons in his way. Life in Orabe’s edition. Cave. Mosheim and Milner’s Church Histories.